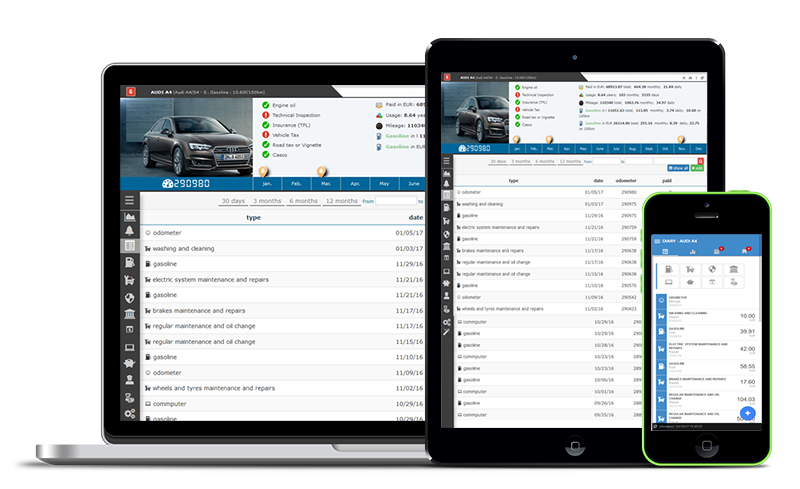 Carendar is powerful online instrument to control usage, to calculate costs and to facilitate the maintenance of your vehicles. Insurance policies, repairs, technical inspections, maintenance, tyres change, documents validity, important dates and mileages, guarantees, etc. usually annoying events and obligations are now easily managed with few clicks. Carendar is multi-platform applicateion, accessible from any mobile device. Your data is stored directly in the cloud and is accessible immediately online. Carendar is useful tool to facilitate planning of your expenses. Carendar will take care to send you proper notifications on time, based on projected mileage or particular dates. Save contact details and GPS position for visited garages, repair-shops, fuel-stations etc. Which parts did you replace and how much did you pay for parts. You will receive notifications for up-coming waranty and/or expiration times or miles. Never forget to do technical inspection or to change the oil on time. Carendar will take care to send you prompt notifications on time, to let you plan your time and expenses.